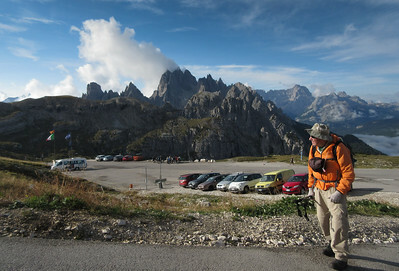 The second part of our trip was an 11 night stretch in various places in the Dolomites: Cortina, Canazei, and Compatsch. The goal was hiking, and the weather occasionally cooperated. The first task on this part of the trip was to pick up a rental car. 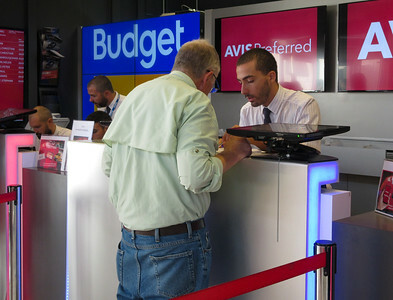 Despite the fact that we had arranged such five months previously, things were moving at glacial speed at the Budget/Avis desk. On the road at last, headed north from Venice on the Autostrade. 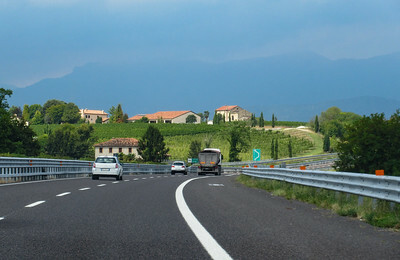 We started seeing vineyards almost immediately. Ah, some mountains as we travel further north. 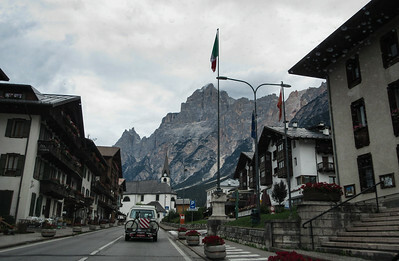 One eventually leaves the autostrade, and drives on two-lane, 1.5-lane, and single-lane roads and streets to get to Cortina d'Ampezzo. 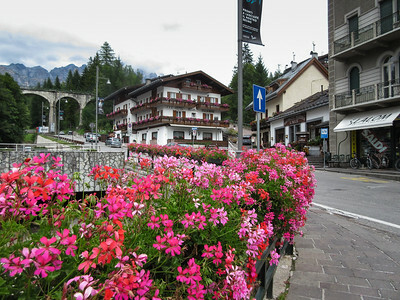 This is the msall village of San Vito. 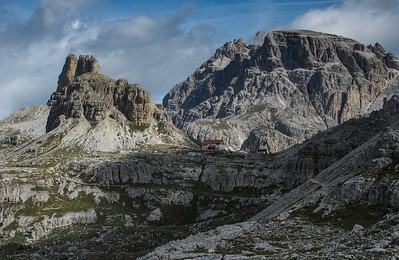 Cortina. Our hotel is in the upper center of the photo. 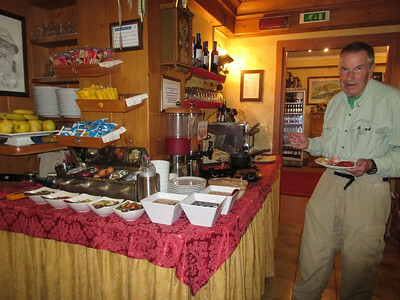 The rooms, as we expected, were modest, but the proprietor was super friendly and helpful. 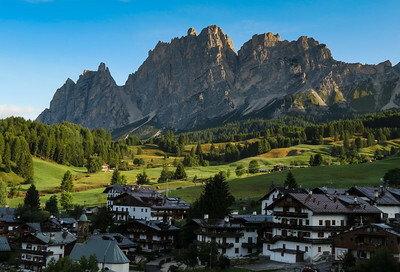 It's less than 150 km from the airport to Cortina. The drive is supposed to take two hours, but plan on three. But since it was mid-afternoon when we arrived, we thought we would walk a few hundred meters to the town square and scope out some of the stores. 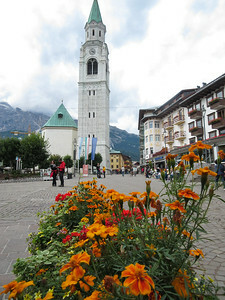 The famous clock tower is in the background. 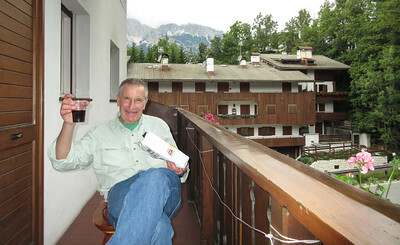 Roger is enjoying a glass of wine and some snacks on the balcony of our room. 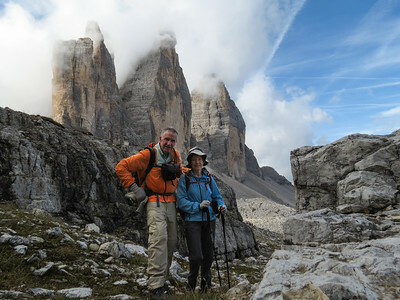 The next morning, the weather looks relatively good, so Roger is dressed for, and is eating a nice breakfast for, a good hike today. 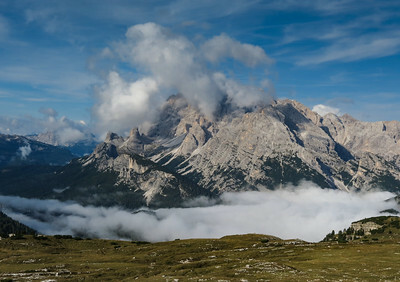 Climbing out of Cortina, we captured the peaks above town with some nice morning light. 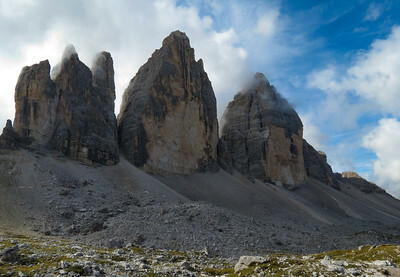 The trailhead for Tre Cime, or the Three Towers, I guess, is about an hours drive outside of town. 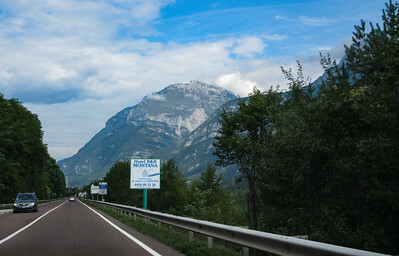 To get to the trailhead, you have to pay 25 Euros on a toll road. But hey: parking is "free" Here, we have suited up and are climbing above the parking area. We were simply ahead of the hoards. 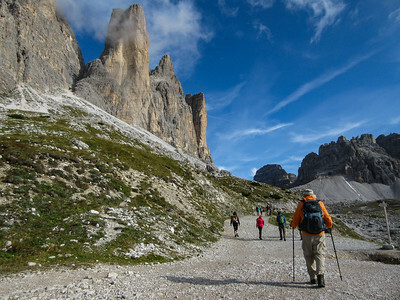 The Tre Cime hike is probably the single most popular hike in all the Dolomites. Not only is the formation pretty impressive, the surrounding country is pretty spectacular. For the first mile or so, the trail is pretty flat, and suitable for vehicles. But you do start to see really great scenery right away. Roger photographing. 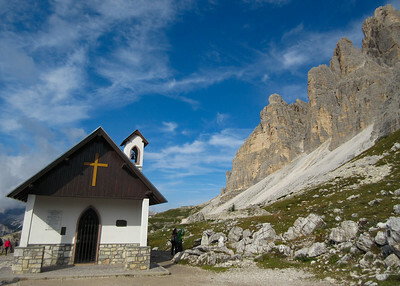 Rifugio Auronzo, at start of hike, in the background. 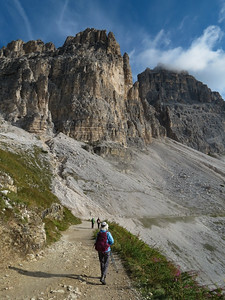 The trail snaking ahead toward a small church. Obviously, the weather, from a view standpoint, was still sorta iffy. More and more people on the trail. 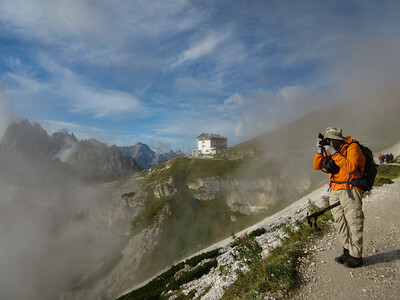 As we approached the Refugio Lavarado, there was a nice sign that told us where we were. 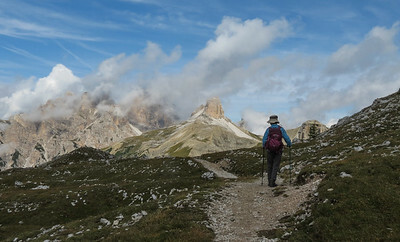 It seemed that in the Alps, of which the Dolomites are a part, signs are everywhere, the emphasis is not on self-reliance, but rather the quality of the food at the huts or refugios. 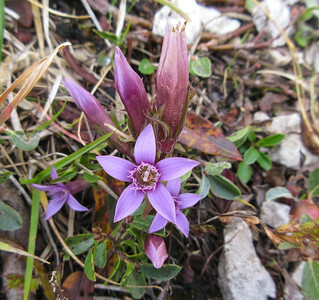 We have no idea what this flower is, but it was pretty. 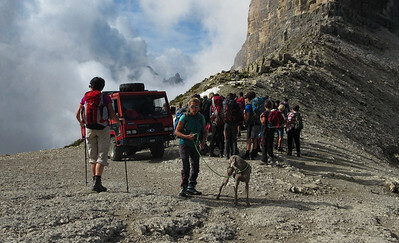 It can get crowded at the saddle, The truck (another one appeared very soon) is up there, I guess, so that it can re-supply the rifugio. 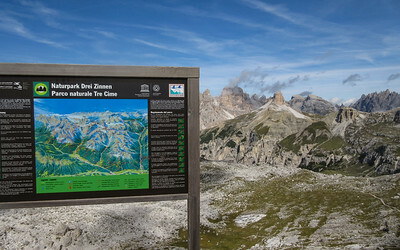 Form the sign, one climbs about 350 feet to a saddle, where you have another sign. 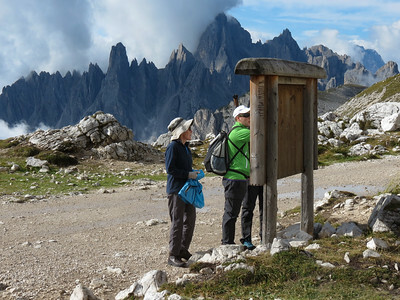 It is interesting to note that no tent camping is permitted in this "Nature Parks" The only way to spend the night is in a refugio. 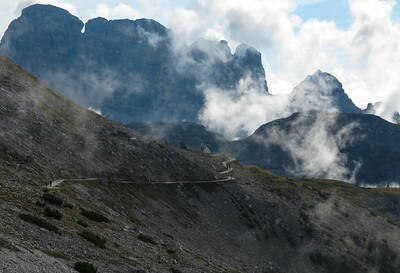 The view from the saddle. 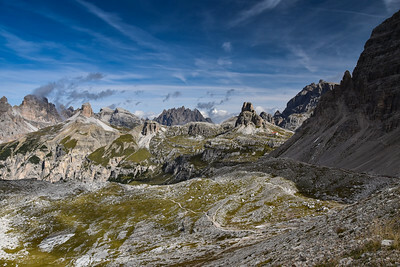 Just right of center, you can see the NEXT refugio (red roof), and the trail leading out to it, which is the "official" route. However, wanting to get away from the people we decided that we would leave the main trail and descend on to a plateau which appears to have a good trail. 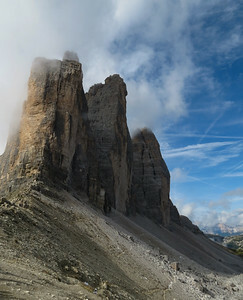 The three towers from the general area of the saddle. We hiked down the less popular trail. It was rocky but far far fewer people. We always can use some photos of the two of us for the Christmas letter, so this was a good spot. Susie hiking on a less rocky section of trail/path. Backing off from the towers, one can see a trail/path closer to the base. 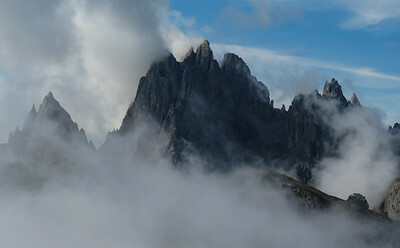 A telephoto shot of the Refugio Tre Cime. 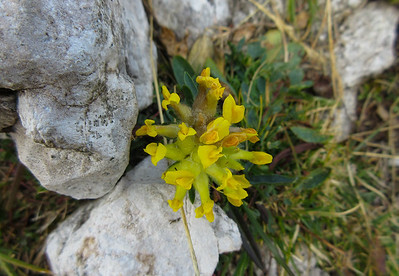 although it was late in the season, there were still a few wildflowers around.